Charles and Lizzie Peterson love puppies. They have a puppy of their own but they still foster other puppies who need their help. When Lizzie spots Noodle he's in some major trouble. Once they rescue him, the Peterson's can't figure out where his people are. 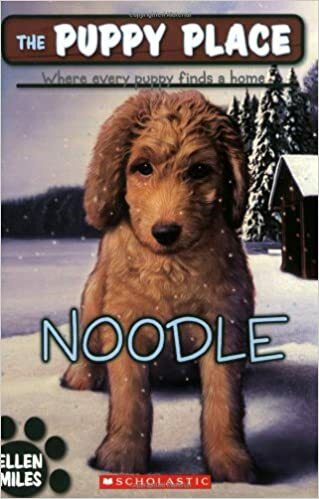 Lizzie is determined to find Noodle's family, but the question is, do they want to be found? dashed down to the shore and grabbed the rescuer’s rope, falling into place behind the other men. They all leaned back with their feet planted on the ground, like they were playing tug-of-war. Lizzie peered through the binoculars. Now she could see the puppy clearly. He looked wet and cold and miserable — but surprisingly, not too scared! He wasn’t struggling at all. Emily had stopped trying to swim and was just holding the puppy tight as the guys on shore reeled her in like a giant red fish.